We cater to several corporate clients as well as colleges to change the method of teaching from a classroom setting into an outdoor setting. The Outbound Training Development Program is a powerful method of enhancing your ability to resolve conflicts, issues and disorder in your current system. While going through our training you will learn to put your ideas of individual achievement aside and focus on teamwork and camaraderie instead. There may be a step that you have been conservative about, but we use adventure and thrill as a tool to make you push your limits and get you out of your comfort zone. That is when you will discover a life changing moment, maybe even an epiphany! While working in an fast paced atmosphere where you are expected to work as a team and delegate tasks and duties to your fellow team members, you are required to handle uncertainties, develop strategies and resolve issues. In our outbound training program we get you involved you in many such mentally and physically challenging exercises where you will learn to develop your understanding towards managing such tasks to maintain the healthy atmosphere at your work place and enhance the growth of your organization. There are various games and activities that we get you involved in. We provide the basic tools of the outdoors, training material and highly intense motivation. For the rest we expect you to bring student mentality, energy and enthusiasm. In our activities section you can check out some of the activities that you will go through during the course of your training. We give high importance to safety, all our equipment is tested before operation and training is conducted under the guidance of highly trained and educated instructors. 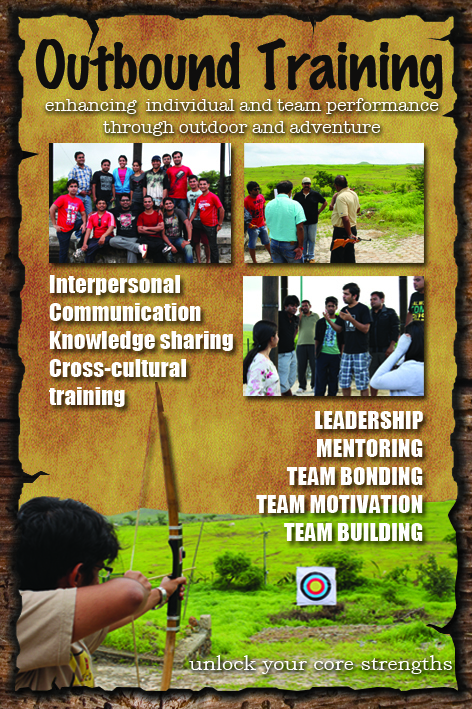 We accomplish your experience under our 'Raw Outdoor Culture' banner.